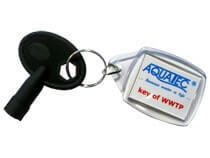 What does the basic delivery of Aquatec VFL wastewater treatment plant include? 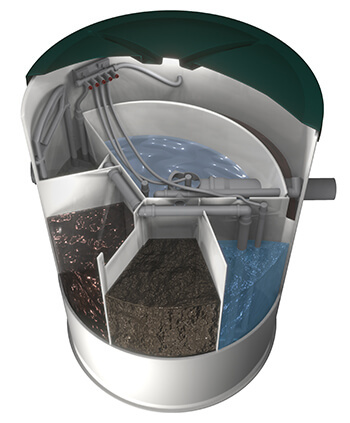 The standard delivery includes comprehensively tested residential wastewater treatment plant consisting of an all-plastic PP tank, a DN 125 inflow pipeline, a DN 125drain pipeline, a built-in technological structure (de-nitrification, nitrification, separation) along with aerating and re-pumping systems. 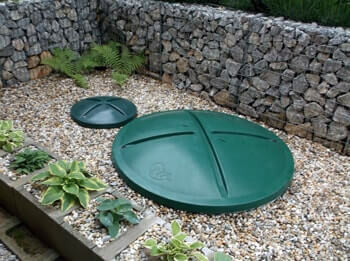 The green monolithic cover can be easily incorporated in your garden. It is made of UV stable polypropylene (PP). 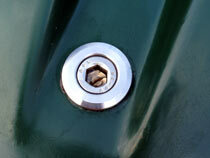 The locking system has a child safety feature. The cover is included in a basic version of the plant. The" SECOH" blower aerates through individual parts in the wastewater treatment plant which is connected to the wwtp by a ¾ hose which is located in a 50 DN protective sleeve. The blower may not be placed farther than 5 meters from the wwtp. If the distance exceeds 5 m, the blower must be placed in a blower shaft; see the accessories. The blower is included in a basic version of the plant. The inflowing sewage water collects abruptly into the accumulation device (e.g. 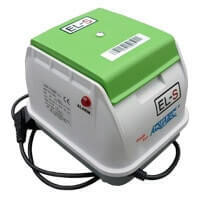 bathtub, washing machine discharge...) that contains approximately 160 litres. The accumulated sewage water is dispersed from the wwtp through a continual outflow of 3 to 4 litres per min. The device is included in the basic version of the plant.